Camping pod sleeps 2 adults on 2 single beds, or push together to make a kingsize bed. Fully insulated, locking door. 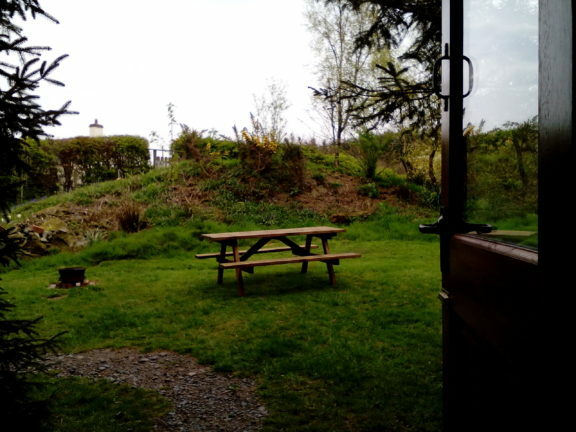 Sited facing morning sun, it has its own campfire/BBQ hearth and grassy area. Picnic table and BBQ chairs provided. Electric light and sockets,Electric wall heater, electric kettle and toaster. A box with mugs, bowls, plates, cutlery and cooking pans etc. Car parking close by, 50 m level walk to facilities, – toilet, shower, washing up sinks. OR We can hire you bedding,linen and towels for an extra charge per person, per stay. In peak season, July and August we prefer bookings of 2 nights or more, but accept one night bookings. Please note no cooking is permitted inside the pod or on the decking at anytime. Dogs are permitted in the pod if you ask us first, maximum of 1 large or 2 small dogs, and we may charge a small fee of £2 a dog.